The Keyword Difficulty tool is now available via API! Now you can automatically receive an estimate of how difficult it would be to overrun your organic competitors with a particular keyword. 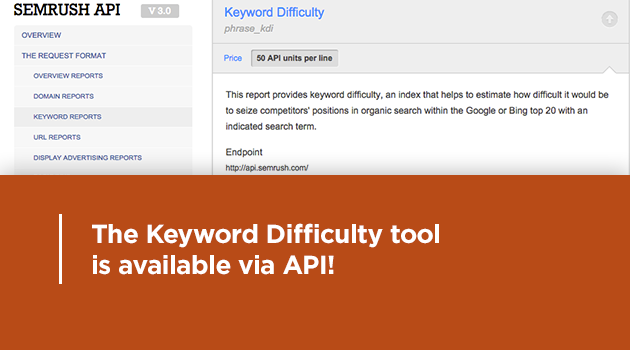 If you have your own applications, widgets or plugins, you can enhance them with data pulled from the SEMrush Keyword Difficulty tool! Check out our API documentation and add a keyword difficulty index to your services! The Site Audit tool helps you become mobile-friendly!